My husband and I took a road trip over Fall Break to visit the Center of Southwest Studies at Fort Lewis College in Durango and the Southern Ute Cultural Center and Museum in Ignacio. We had the opportunity to meet some wonderful people, who extended a warm welcome to us. The first stop of the day was at Fort Lewis College where we had the privilege of meeting and having Jeannie Brako, Curator of Collections as our tour guide. For over 35 years Jeanne has been dedicated to the advancement of museum methods and practices. 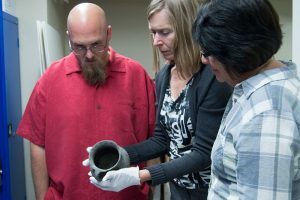 She is the first Curator of Collections at Fort Lewis College’s Center of Southwest Studies. Her primary research interests focus on textiles and conservation techniques, giving her national reputation as a textile and objects conservator. “Parks, People, Preservation: Celebrating the National Park Service in the Southwest” this exhibit was centered on the national parks, monuments, and historic sites. The Four Corner states of Colorado, Utah, Arizona, and New Mexico were represented in this exhibition through historic and contemporary photographs and objects. “Time Exposures: Picturing a History of Isleta Pueblo in the 19th Century” The overall exhibit recounted the story told by the people of the Isleta Pueblo, how the arrival of the American soldiers and explorers in the mid-1800s changed their world dramatically. The exhibit was divided into three parts: first section described a traditional year for the Isleta community of ceremonies, hunting, gathering and farming, second section was the arrival of the Americans and the ways in which they disrupted the way of living for the Isleta Pueblo by the taking of their land and other resources and the third section of the exhibit showcased hundreds of historical photographs. “The Durango Collection” contained one-of-a-kind textiles woven by both male and female weavers and represent the Pueblo, Navajo and Hispanic traditions. The best part for me was seeing their archival process…the work rooms, lighting studio, their processing room for archives and the process of archiving the new acquisitions. Next stop was a visit to the Southern Ute Cultural Center and Museum where our tour guide was Linda Baker, who is a member of the Southern Ute Tribe. Linda’s sharing of the history of the museum and of the exhibits was more than one of a curator, it was a personal sharing of her people. Two things Linda wanted us to know about the Southern Ute Indians was that they were a mountain tribe and they did not have a migration story. On display in the welcome gallery were four cases with artifacts connected to the “Ute Seasons” (four seasons). 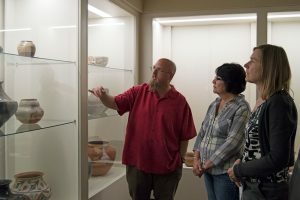 As we walked throughout the museum viewing the display cases I felt that we were the lucky ones to have Linda talk about the objects on a personal level. I could see the pride she has in her heritage and her people. Also on exhibit is the, “Mountain Lion” exhibit curated by Jed Smith from Alamosa. Jed is an amazing young man who attended Alamosa High School and was a classmate of my youngest daughter, Marisa. He attended Fort Lewis College and did his internship with Jeannie at the cultural center. After graduating he was hired at the museum in Ignacio. I told Jed I would put the invite out for you to stop and see his current exhibit and any future ones. So, if you are ever in Ignacio do stop by and let him know how you heard of the Southern Ute Cultural Center and Museum and of his exhibits. I would say that this part of my journey as an intern has been a remarkable experience. I have learned so much and my interest in museum work has increased. I was very fortunate to have spent the day visiting with Jeannie Brako and getting to see Fort Lewis College’s Center of Southwest Studies and Linda Baker at the Southern Ute Cultural Center and Museum. Thank you to all who made this experience possible. The next time you are planning a trip, I would highly recommend these two sites as places to visit. Safe travels.